G20: What’s wrong with mentioning climate change? President Barack Obama sent me an email last week. It’s not unusual, as he’s been doing it for six years now, ever since he ran for the White House and won. I’ve voted for Barack Obama twice now, and the Democratic Congressional Campaign Committee (DCCC), the Democratic National Committee, and Organizing for Action (OFA), have been sending emails to party supporters like myself … myriad emails on behalf of the Congressional candidates in the recent midterm elections. I don’t mind, even when they ask for money I don’t have, because the Republicans have always had more money. All’s fair in love and war and politics. But I was extremely disappointed, as was the President and the party faithful when the Democrats lost control of the Senate, and the Republicans now have the majority in both houses of Congress. The President hasn’t had a great year – glitches in Obamacare, still the most important part of his legacy; some hesitancy in the management of the Ebola crisis; and more hesitancy in how to handle ISIS, after his staff played down the threat of the Islamic State. But unemployment has fallen to a six-year low of 5.8 per cent; 214,000 new jobs were created last month; and President Obama and the Democrats are still fighting for equal pay for women, raising the minimum wage, reining in corporate polluters, curbing Wall Street excess, and protecting the voting rights of minorities. Well, Clarence was more cautious than most of the pundits, and I also thought it would take Barack Obama until 2012 to become president. But after the re-election of George W. Bush and the defeat of John Kerry in 2004, Barack Obama was fast-tracked by the Democrats, and became the first African-American president in the historic 2008 election. Whew! Greg Sheridan was also critical of Gough Whitlam’s soaring visions, but I think Gough inspired a generation of Australians, including me, and Barack Obama has also inspired many young Americans, and young Australians. Just listen to these vox pops of students after the president’s speech. I would walk an extra mile to hear Barack Obama speak; and sometimes Tony Abbott states the bleeding obvious as he did when he addressed the world leaders at the beginning of the summit, complaining about his inability to get Australians to pay a $7 doctor fee, and bragging about repealing the carbon tax. Barack Obama might be a lame-duck president, but I doubt that he will act like one. I think he will fight for the issues he believes in – and if he can persuade a Republican Congress to work with him, he will leave quite a legacy. 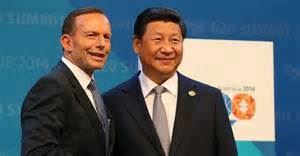 UPDATE: The Sydney Morning Herald reports: After talks with the French President Francois Hollande in Canberra, Prime Minister Tony Abbott has called on countries to set strong binding emissions reductions targets at next year’s major climate conference in Paris. Hey Tom, Couldn’t agree with you more. Love to you and yours, Cold up north. PS: I knew the Obama was destined for Pres with that Dem convention speach. Hi Betty, Thanks for that. Yes, it’s a shame about the midterm elections. It will be harder for him to accomplish all the goals he has set for the U.S. Stay warm!